Clean cheap and cheerful...the appartments were set in the hillside with superb views of the little cove beneath. The manager Fedon was cheerful and extrememely helpful. Really relaxing. The view from our appartment was amazing - sunrise every morning! The owner and the other ladies were very friendly and helped in every way! 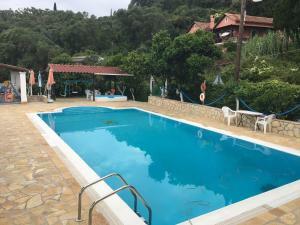 Not only the beach is 200 m away, but also the bus station for green buses (long distances to the south and Paleokratitsas) and blue buses (Corfu city bus, also directly to LIDL). A rented car might be nice, but with this appartment, you do not need it! Achilleon is in walking distance, too. The swimming pool and the friendly and helpful owners. Being able to get a meal cooked when ever wanted. Very polite and Nice People working there. Short distance to the Beach. Try the little Beach just Down the road - Nice, clean and a very good cafe. Lovely location away from the hustle and bustle and with lovely views across to mainland Greece. Lovely owners who really gave the experience the personal touch. Far better than staying at a chain or faceless hotel. Great for a quiet few weeks away from home in lovely weather. Spacious room, adequate AC and a great bedroom balcony view thtough the vine leaves. We had a good Greek breakfast next to the pool the first morning (after a very late arrival that night that was not a problem whatsoever) with no pressure and an end-of-breakfast time. For the rest of the stay we took advantage of the room's kitchen facilities to have breakfast on the room's balcony, so we didn't even have to get dressed. Great atmosphere! The owners of the Andromaches as well as all people who are working there are really friendly and helpful. The sea is very close to the apartaments. The pool place is very comfortable. Children have a plenty space to run and play. Certainly I would back there some day! The apartment was very well appointed with a clean fresh well equipped kitchenette, all the tools we needed for our stay were available. The bed was clean and very comfortable. We had a lovely large shower/wet room which looked as though it was newly decorated. The view from the terrace was stunning within sight of the distant shore of mainland Greece. The hosts were friendly and helpful, nothing was too much trouble. The pool area was clean and the shade was a most welcome addition to the poolside. Food was good and the serve yourself from the fridges was welcome! Not too far to walk to the village and the beach was just at the bottom of the hill a few minutes walk away. Would definitely recommend for a relaxing, quiet stay and would go back again. Very friendly staff who were extremely helpful. Good pool area and nice views out to sea. One of our top picks in Benitses.Enjoy your own studio or apartment in this friendly complex, just 650 feet from Benitses Beach. 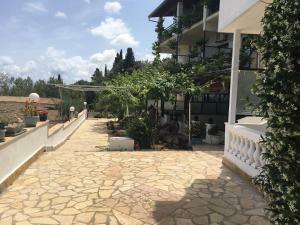 These apartments are located just outside Benitses, a small fishing village on the eastern coast of Corfu. Surrounded by a large garden, the property enjoys an excellent position and offers enchanting views of the tempting, blue Ionian Sea. The residence lies south of Corfu Town, and is just minutes from other unspoiled sandy beaches with water sports. 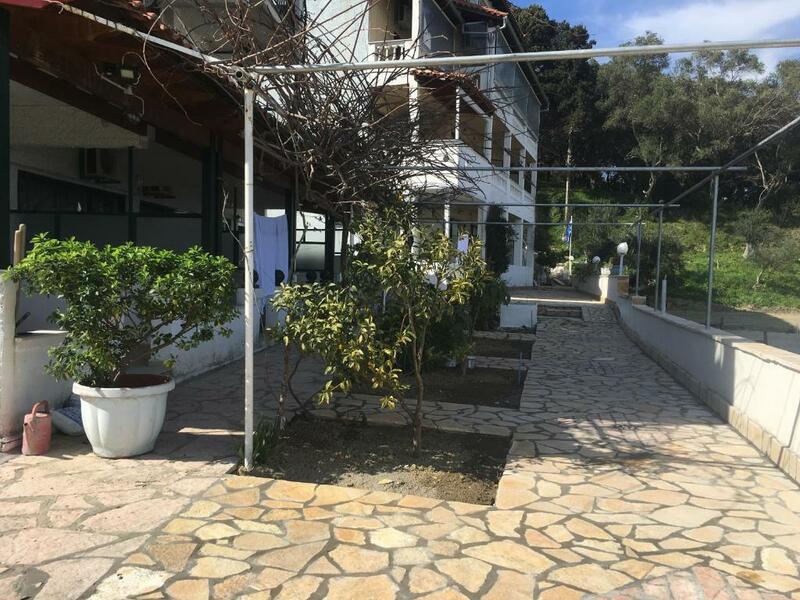 A wide range of restaurants, bars and cafés are available, while traveling along the coastline will bring you to other traditional Greek villages and tourist towns. A bus stops just 650 feet from the property. When would you like to stay at Andromaches Holiday Apartments? Please note that maximum occupancy is 5 guests (see hotel policies). Ground floor room including a kitchenette, air conditioning, satellite TV and a large terrace with sea views. An extra person can be accommodated. Please see hotel policies. Andromaches Holiday apartments are the best-located apartments in this area around. All apartments sea view All apartments totally independent (you do not have to pass thru reception or main entrance). They are built in the hill surrounded by the forest of olive trees. Fast excess to the main road and the same time total quiet. We are in the center of Corfu island North South East West This gives you the opportunity to visit all the island with no big trouble with a car or local buses or even motorbikes. The famous Corfu town is only 10 km away 15/Minutes By local bus. Benitses port for your sea excursion, markets, restaurants, bars, sea sports only 800 meters away. 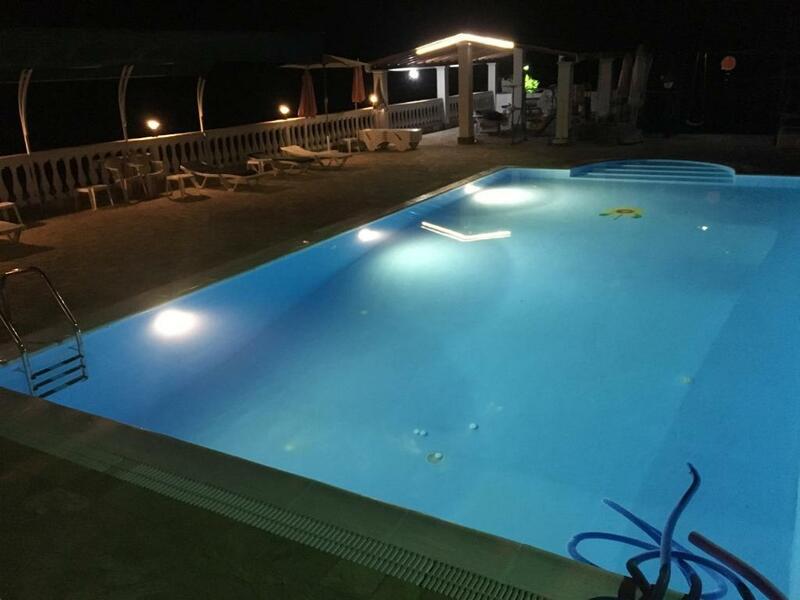 You can sun tanning in the spotless beach near to us (Faliraki 200 meters) or enjoy the supper view from your sun bed at Andromache's apartments outdoor pool.!!! The owner is a Greek Canadian, Married to a German lady. Serving gusts from 1986. 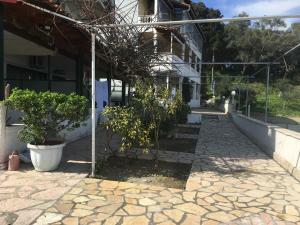 Hard work and good touristic study's make Andromaches Holiday Apartments the leader in filoxenia around Corfu. We all are overlooking the Ionian sea and the beautiful sunrise every morning having as a background the mainland Greece. We are steps away from the land kings build there own palace to enjoy the same view we are enjoin from Andromaches apartments balconies.!!! House Rules Andromaches Holiday Apartments takes special requests – add in the next step! Andromaches Holiday Apartments accepts these cards and reserves the right to temporarily hold an amount prior to arrival. Please note that the pool is only open for use from 18 May to 20 October each year. Please note that breakfast and meal supplements are served only from May 18 until October 20. Please note that solar USB chargers are available at the pool area for the mobile phone or tablet. Please note that no chlorine is used in the pool. Please inform Andromaches Holiday Apartments of your expected arrival time in advance. You can use the Special Requests box when booking, or contact the property directly using the contact details in your confirmation. The downside was that to eat out or even buy food supplies we had to face a walk along a bendy busy road with broken pavements, missing cliff railings etc - bring a torch!! The fitness room ist not more than 6 m² and not very attractive. But it works! The road into town was very busy and the paths are not in good condition. The location and very peaceful. 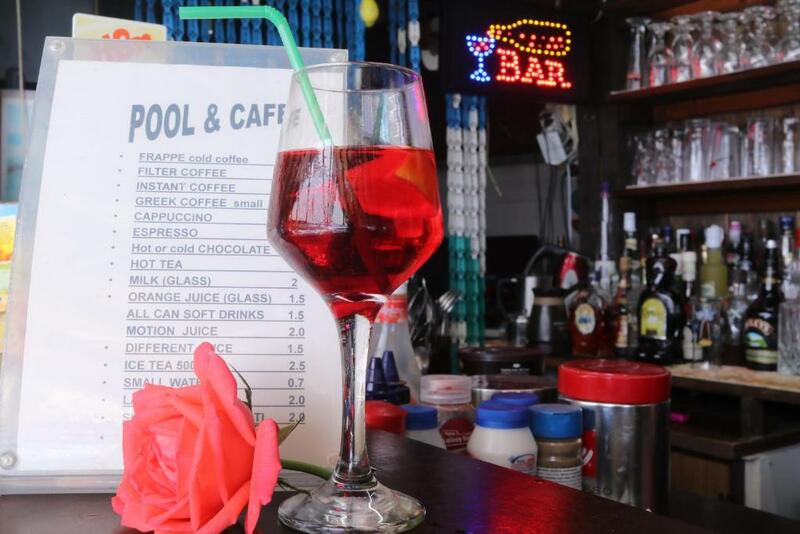 Plenty of sunbeds and a lovely pool. Only that the bar area looked cluttered with some unusual and some amusing nick nacks! No lounge area in room so a little cramped for the four of us although the bedrooms were OK. Furniture and bathroom quite old and in need of modernised although everything worked well and we never ran out of hot water when all of us had consecutive showers!